One of the biggest challenges to playing Specimen is handling the crew. While both sides have the same overall goal – destroying the other – I think that succeeding as the crew can be more difficult. The Specimen player, being able to see the whole game map, and where the crew is at all times, can plan how to move and damage sections of the ship, or attack if the opportunity arises. Since the Specimen remains hidden for the most part, the Crew player faces more of an uphill battle in planning a strategy. During many play tests, Crew players have asked us for help. “I’m not sure what to do next,” is a common phrase. This uncertainty often leads to a cautious play style. Sometimes that’s warranted, and you can win by erring on the side of caution. But it can often lead to lost opportunities, particularly during the early turns of the game. That said, what can the Crew player do to be successful? Make sure you understand where you are in the game. During turns 1 through 5, you are at your strongest. This is the time when you should be the most aggressive. You shouldn’t be too concerned with leaving two crew members in a section. At this stage of the game even having a single crew member alone isn’t necessarily a death sentence. In turns 6 through 11, you will be about even with the Specimen. At this point, the crew should only move around in groups of three or more. After turn 12, the crew is definitely on the defensive. Only engage in combat if you absolutely have to! Hopefully at this point you will have wounded the Specimen several times, so it won’t be overly aggressive. The biggest problem you face at this point is that there is no strength in numbers! The Specimen can wade into a large group of crew members and have a decent chance of killing several of them. Here’s where the nets and the “Run” events can really help. At the beginning of the game one of your biggest advantages is strength in numbers. 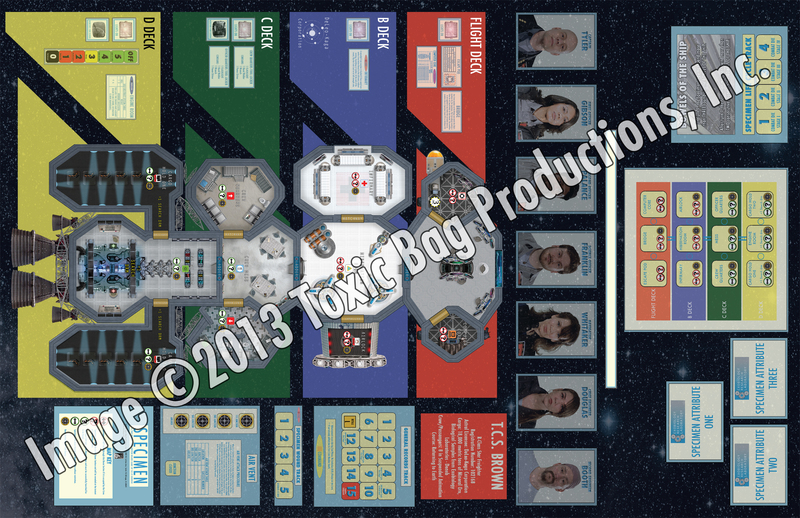 You have seven Crew members, each of whom roll a die in combat. The Specimen is all by itself, and at the beginning of the game it can only roll 1 die in combat. Use that! Later on, when the Specimen is at Stage Four (and rolling 4 dice in combat), then you should run. The two main things the Crew does during the game are search for the Specimen and attempt to repair the ship. To go along with that, each Crew member has a search skill and a repair skill. Figure out who’s good at what, and maximize your chances to succeed by having the better searchers do the searching and the repairers do the repairing. Also remember that you can have multiple Crew members make a repair or search attempt. This means that all of their search or repair skills will be subtracted from your die roll. During the early game period, don’t be afraid to have the crew separate into small two- or three-person groups. It’s very common to have a search party and a repair party moving about the ship. Make sure you know the layout of your ship. The T.C.S. Brown has four decks. Each deck has three room sections on it. Movement between decks is restricted to the access ladders located in the center sections of each deck. The first two decks, Flight deck and B deck, are both well lit, and contained. In game terms, this means that the Specimen can’t hide in any of the sections on these decks, or move through them without being seen. C and D decks are just the opposite. Poorly lit and spacious, the Specimen can hide and move on these decks with impunity, only revealing itself when it attacks or if the Crew successfully searches for it. With this layout, it will take a brave Specimen player to move around on Flight or B deck early in the game, while the lights are on (There’s a Specimen event that causes the lights for an entire deck to go out, allowing the Specimen to move and hide on that deck). Most of the time, the Specimen will be down on C or D decks. That means that you should be able to have the majority of your crew search the six sections on those two decks. Now, that doesn’t mean you should ignore Flight or B deck; just don’t have a crew party up there! We’ve seen games where the crew just sits on B deck and rarely ventures down onto C or D. Most of those games ended with the ship being destroyed, since the Specimen had a free hand to damage all of the sections down there. The damage would then spread to the Flight deck and B deck during the end phase. One viable strategy is to have one or two Crew members sit in the Hibernation Room on B deck. Since this is where the access ladder leading up from C deck is located, you can guard the two top decks from the Specimen (At least it would have to reveal itself as soon as it moved up the ladder and entered the Hibernation room). 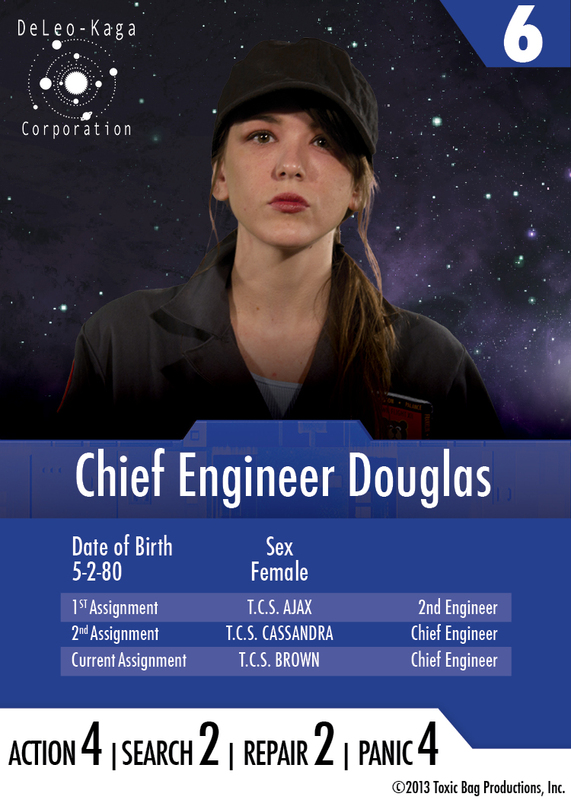 Having a crew member on the Bridge can aid in your search rolls. As long as the monitors are working (another Specimen event can cause those to crash as well), you will get a -1 Search drm to any search attempts. It’s only a -1, but often that’s the difference between success and failure. And don’t forget the Computer Core on the Flight deck. 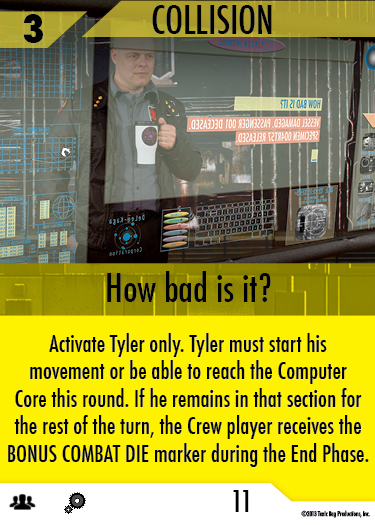 If you have one Crew member go in there and successfully activate the computer, you can get a bonus card added to your hand for the next turn. You can do this every turn, so you could potentially draw six cards every turn. This will allow you to cycle through your deck faster, as well as get you the events and combat cards you need to win the game! 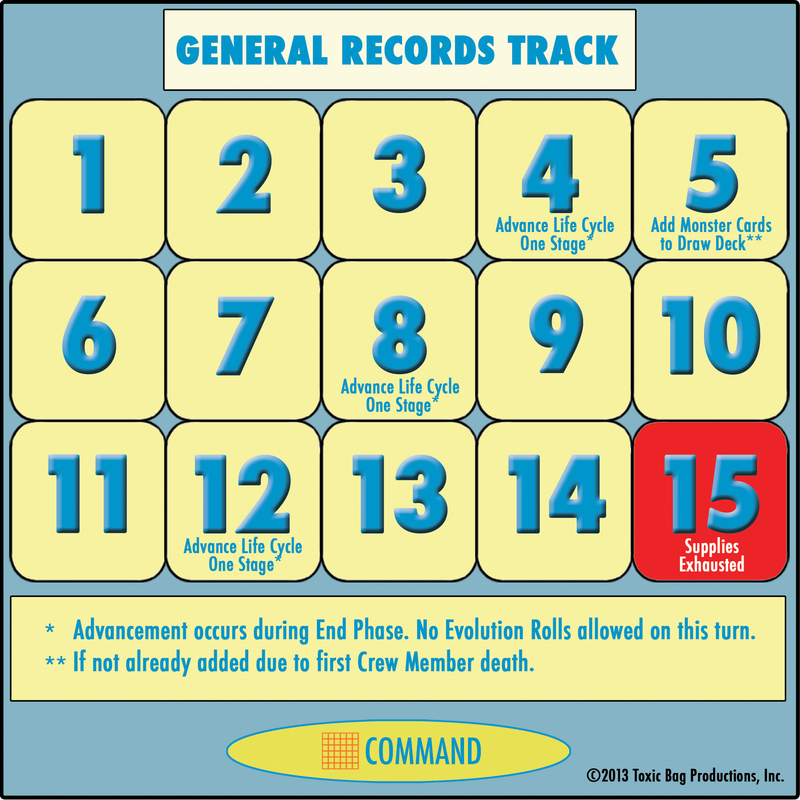 Of course, the drawback to this is that the Crew member who does this must remain in the Computer core for the rest of the turn. So, you’re basically eliminating one of your crew members from searching, repairing, or ultimately killing the Specimen. There are tool lockers located on C deck in the Crew and Officer Quarters. Each locker contains a flashlight, wrench, hand welder, and sonic driver. The flashlight can help in searching, while the other three can all help with repairs. Each tool provides a -1drm in addition to the repair or search skill of the Crew member who is holding it (the skill values are also subtracted from the Crew search and repair rolls. Low numbers are good!). Don’t be afraid to use them. You should stack the deck in your favor as much as you can! The decision you have to make is, should you make a good repairer or searcher really good, or make an average or below average crew member better. Both strategies have merit. Whichever way you go, don’t forget about the tools! The weapons enter the game through the play of strategy cards. There are three that appear in the yellow “Collision” card deck and two more in the red “Monster” deck. When we were first conceiving the game, we debated whether we should have weapon events or just make them available after the first crew member death, or on a certain turn. We had a hard time believing that the Crew player would pass on the events. But after hundreds of play tests, it’s mind-boggling how many people don’t play the weapon event cards! The weapons in the yellow “Collision” deck are the Electric Prods, Nets and Trackers. All of these are at their most effective when the Specimen is small. They lose effectiveness as the Specimen evolves (You subtract the current Specimen life cycle number from the weapon’s drm). It’s a mistake, though, to think that these weapons are useless later on in the game. They’re not; the Prods can be overloaded for a one-time combat drm of +6 (which would get you a +2 drm against a fully grown level four Specimen). The Nets offer an even better late game option. After the first round of combat, the Crew player can opt to toss a Net at the Specimen and automatically escape while it’s freeing itself from the net. This can be huge during the later turns, and save several crew lives by stopping combat after one roll of the dice. Of course, both of these options will result in the weapon being destroyed, but they both can contribute to winning the game. The two weapons in the red “Monster” deck, the Pistols and the Flamethrowers, are pretty much no brainer events to play if you draw them. Especially the Flamethrowers. They’re the most powerful weapon the Crew will get. Also, since the “Monster” decks are so large, the chances of seeing a card twice in a game are slim. So if you get the event, you’d better play it. Perhaps the most difficult part of game strategy is deciding when to play a card for the event or for the character points. For the Crew this can be more troublesome, since it always seems that when you want to play a card for the event is when you really need to move your crew and regroup, or repair, or launch a counter attack against the Specimen. That said, there are a couple of events to be aware of. The first one is card #4 “We split into two teams.” This card is probably more misunderstood than any other in the deck. 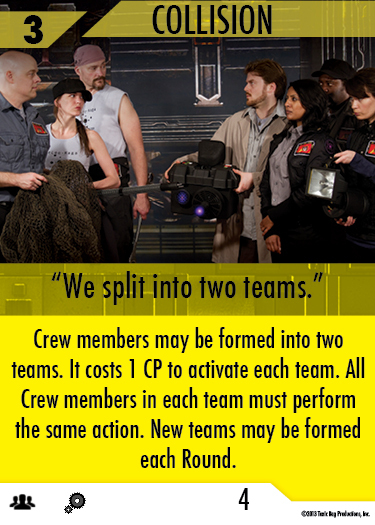 It allows you create two teams of crew members each round. Each team can be activated with one Crew point. This means that no matter what CP value card you play, you can move your entire crew every round, if you want to. Of course the team members will all have to perform the same actions, but since you will probably be forming search and repair parties anyway, this is not much of a hindrance. This event is huge. Don’t skip it unless you absolutely have to. For more, see the “We Split into Two Teams” Specimen Strategies video on our Videos page. The next two cards both provide the same function. 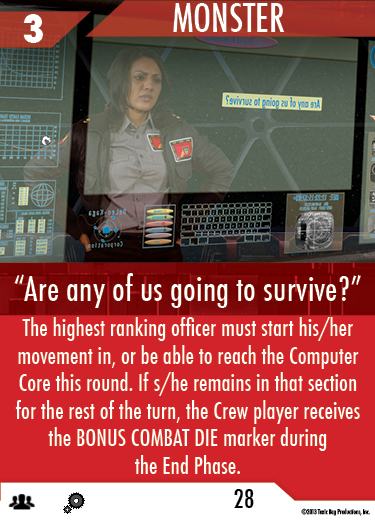 Card #11 “How bad is it?” and card #28, “Are any of us going to survive?” each give the Crew player a marker that can be turned in to get an extra die to roll during any future combat. An extra die in combat can make all the difference in the world. So playing those two cards as events is definitely a good idea. 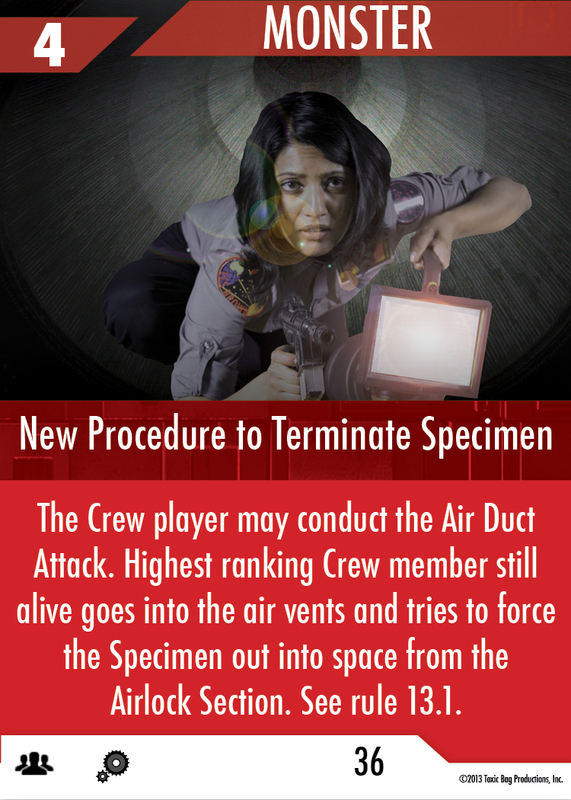 The last card to discuss is card #36 “New Procedure to Terminate Specimen.” Much has been said about this card already (see our video on it on the Videos page for more info). The big question with this card is: should you play it as the event? That totally depends on how you feel the game is going. It’s a really fun event to play, and it gets the blood pumping in both players. Playing the Crew in Specimen is certainly a challenge. The uncertainty of the cards, and the unknown makeup and location of the Speicmen, can combine to drive you crazy. All you can do is try to keep damage to a minimum, and try to wound the Specimen early and often. Good luck; you’re gonna need it! This entry was posted in Game Mechanics and tagged board game, Crew, horror, science fiction, Specimen, strategy. Bookmark the permalink.